With her characteristic, unnerving attention to minor details, Karin Fossum opens her compelling new novel with a description of a mother putting her baby daughter into a pram in the garden while the infant sleeps. The atmosphere of menace builds up to an almost intolerable point as we just know something terrible is going to happen. The plot shifts to the police investigation of the incident, focusing on Inspector Sejer as he ponders both on the crime and on his own personal life – which is rather nice to read as Sejer has taken a bit of a back seat in recent novels. While he is sitting at home thinking, he hears something being delivered through the letterbox; rushing to the window, he sees what appears to be a slim young man hastily leaving the area. The missive turns out to be a postcard, with a sinister image and message implying that there will be more crimes in future. What follows is a series of nasty tricks: a dying man receives a call from the undertaker, a well woman reads her own obituary in the paper, a young boy goes off on his own on a trek, and so on. We see these events through the eyes of the presumed perpetrator (but nothing is as it seems in a Karin Fossum novel! ), who is a bored teenager called Johnny. He lives with his drunk mother whom he hates, travels around the region on his moped, and pays regular visits to the one person he relates to, his grandfather. We also, however, see events through the eyes of the “victims”, following the consequences of the mean pranks that often are the trigger for quite significant events in the relationships of those affected. These vignettes are one of the author’s main strengths, as she draws the reader into the lives of her subjects even when they appear only briefly in the novel. My favourite character in the book is a young girl, Else Mietner, who rides a blue bike and shouts rude comments at Johnny as he rides past on his moped en route to his grandfather. Else is another victim of a cruel prank, but her method of dealing with it is brilliant. She’s very independent and observational – qualities which allow the reader to know what happens at the end of the book as a grim trick or two turn the tables on the trickster – as well as (in my opinion!) qualities that would make her a very good police detective should the author wish to move forward a few years in her next novel. Else would certainly shake up Sejer and Skarre if she turned up one day in police uniform. 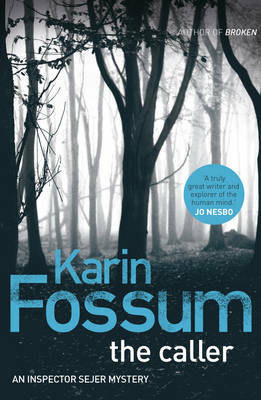 All Karin Fossum’s translated books are listed, with links to reviews, at Euro Crime. Read other reviews of The Caller at Euro Crime (Karen Meek), and by Simon Clarke. I thank Karen of Euro Crime for my copy of this novel. Not only that, Bernadette, but she doesn’t need 500 pages to do it (have read a few recently that suffer from the “150 pages too long for their content” syndrome). I’m looking forward to reading it. Strange, the baby in the pram reminds me of another of her stories … When the Devil Holds the Candle, I think. There’s also the motif of the child’s bike by the side of the road, which appears in at least two of her novels. I definitely remember the bikes, Tim, good spot (and the pram, which I’ve forgotten but I am sure you are right). Maxine – Excellent review as ever. Fossum is certainly talented isn’t she at leading the reader down the “garden path.” And although I haven’t read this one (yet), I do like the way she creates such crackling characters. And completely agreed on the page length! I must catch up better on her stuff. Very good review. I may even read this book, although I usually don’t read psychological suspense. This sounds like a good read. Glad that it is not over-written and overly long. This is getting to be a peeve of mystery readers — the unnecessarily verbose and long texts. Follow the example of Sjowall and Wahloo I suggest. They could do it all with brevity, yet develop characters, write an interesting plot — a page-turner, actually –, have social commentary and a quick denouement. And with some introspection and wit thrown in! I’m for giving their books to new writers and saying, “Exhibit A” on how to write a good mystery. Glad Fossum does this here. That encourages me to read it. That and the characters you describe. Agree, Kathy, I have just read two novels, one 430 and one 480 pages, which would have been even better had they been 250-300 in each case. Some books justify their length but many do not! Hi Maxine. I just took a book out of the library, Blood of the Wicked, by Leighton Gage. It’s doable in a short period of time, not like the proverbial albatross around one’s neck until it’s finished. Great and compelling review, thanks! I can hardly wait to read The Caller – have it on order from my local library, and just finished The Water’s Edge, which was not one of Karin Fossum’s best in my opinion. I do like her character studies and her sense of creeping tension and pacing, even if she is not superb at plotting. Have read almost all her other books in English, and I’ve been searching for Broken, which I hope to get via interlibrary loan. Do you happen to know when her other Inspector Sejer books might be translated into English? I would love to hear her assessment of the recent horrible shooting tragedy in Norway and what she has to say about that perp. Thanks for your response; I see I was not clear on what I meant – was wondering when the other two Inspector Sejer mysteries might be translated into English – found them mentioned on a website as still only in Norwegian, and I believe they are earlier books.